Buying underwear is a nightmare for most men at the best of times. There are so many brands out there, all featuring different cuts, materials, sizes, and fits. It’s nearly impossible to determine which pair will be perfect for you, and which one is likely to put your boys in a death grip. This problem only gets worse the bigger you are. Big dudes have even more specific needs. Not only do they need the support, stretch, and comfort that we all require, they need underwear that’s usually more absorbent, stretchier, and durable than smaller men, but maintains a low cost and a material that’s comfortable and won’t ride up. Given all the different options out there, some overweight men may choose to simply keep wearing the same brand of underwear that they have for years, even though there are probably much better brands out there that are specifically designed for larger men, or offer more features, better fabric, or a better fit. So in an effort to break the monotony and the curse of big dudes who are forced to wear ill-fitting underwear, we’ve put together a buying guide for any large man out there who’s ready to make a change. We’ll go over the best kinds of underwear, materials, and product recommendations specifically for men who are an XL or above. With this information, you’ll feel confident that you’re ready to make a change, no matter what the shortcomings of your particular current brand are. Boxers are the choice of many men out there, and there’s a good reason they’ve been so popular for so long. They’re comfortable, casual, and they don’t restrict you, giving you a feeling of freedom that other types of underwear don’t often provide. However, while they may be good for relaxing, boxers don’t offer any support, and they’re usually not stretchy – made from 100% cotton or other materials with hemmed legs that are often uncomfortable if you’re a larger man, leading to the dreaded “sausage-squeeze” effect where they clamp down on your legs and are quite uncomfortable, even if they fit in the waist. In addition, they’re usually not at all moisture-wicking, due to the materials that they’re made of and their loose fit that discourages close skin contact, and therefore quick moisture absorption and release. This also can make chafing an issue, especially if the boxers are poorly-sized – moisture and rubbing together means that you’re not going to have a good time. So overall, in our opinion, boxers are far from ideal for everyday applications, especially for larger men. Maybe you grew up on briefs. Many men have, and some still love them. It’s not hard to see why – they’re very close fitting, provide tons of support and a skin-to-skin comfort that’s often quite nice. However, the reason some men love them is the exact reason others hate them, especially if you’re a larger man. Briefs have the problem of “crushing the boys”. When wearing briefs, sometimes it feels that one false move is all that is between you and a painful catastrophe. Move the wrong way, breathe too hard, tweak your back or crack your neck, and the powerfully supportive nature of your briefs turns from support to destruction. You’ll have a hard time explaining why you’re sitting and wheezing at your desk in pain, when nothing seems to have occurred. In addition to that issue briefs don’t provide any leg coverage, which can be an issue if you have chafing problems and need to avoid skin-to-skin contact. So neither of these solutions, boxers or briefs, seems to be ideal. So what’s a man to do? Well, Goldilocks, you’re in luck. Between the undies that are too hot, and the ones that are too cold, are a style that’s just right for just about everyone, and pack features and designs that make them ideal for larger men. It’s probably no surprise. Boxer briefs straddle the world of (duh) boxers and briefs, combining the longer legs and roomier fits of boxers with the support, comfort, and stretch of briefs. Honestly, it’s a surprise to us that a big dude would even consider any other style of underwear. They prevent chafing due to their longer legs that prevent skin-to-skin contact, and their tighter, yet breathable fit provides great skin-to-underwear contact that encourages moisture-wicking instead of just absorbance. So. Boxer briefs are the undies for you. But what about materials? After all, you big men out there probably know better than everyone else – not all underwear is created equal. So we’re not done yet. We’ve got to take a look at materials. We would be willing to bet that there are more pairs of cotton underwear out there than any other type. Cotton has been a top choice for undergarments both in modern times, and ever since we began harvesting cotton. The reasons? Simple. It’s very soft, it’s very breathable, and it’s cheap. For those reasons, it’s been the top underwear material since time immemorial. However, cotton is lacking in some areas. Firstly, it doesn’t wick moisture – the very breathability that it boasts means that it tends to simply absorb and collect it, without managing to wick it away or keep you dry. It also has a tendency to pick up smells and cling to them – another drawback of its absorbent and porous fabric, but not what you’re looking for in your underwear. It also doesn’t hold its shape very well – not a problem if you’re just lounging in 100% cotton underwear, but if you start moving around a lot while wearing them, you’ll likely get some ride-up on the back or the legs, which can be quite uncomfortable. So while cotton is a great choice, it’s not a perfect option, especially for bigger men. So what else is out there? Synthetic underwear are new, at least relative to cotton. Generally made out of nylon, polyester, rayon, spandex, or some combination of those, they do offer a high-tech alternative to classic cotton underwear, and boast plenty of features that make them a great choice, especially for larger men. They wick away sweat and moisture very well – the fabric absorbs the moisture while maintaining a dry feel, and the stretchy nature of these fabrics mean there’s plenty of skin-to-underwear contact that enhances the moisture-pulling nature of these technical fabrics. In addition, they tend to combat nasty smells more effectively than cotton offerings, and usually have seamless designs and other comfort features that make them ideal for larger men. However, there are drawbacks. First, these underwear are generally much more expensive than cotton offerings. In addition, men simply don’t like the artificial feeling of these types of underwear. They can be a bit tight and generally feel a bit more “hot” than natural cotton underwear, due to their different materials and moisture-wicking design that’s not as breathable as cotton. Now, if you’ve been paying attention, Goldilocks, you may have figured out what we’re going to talk about next. That’s right! There’s a perfect place for these materials to meet in the middle. Yep! Combining the stretchiness, durability, and moisture-absorbency of technical fabrics with the day-long comfort, breathability, and skin-feel of cotton, cotton/synthetic blend underwear are probably the most comfortable, durable, and all-around great offerings on the market today. There are no real drawbacks to blended underwear, other than the fact they’re typically slightly more expensive than purely cotton offerings. They offer a great mixture of all the traits that make both cotton and synthetic underwears great, and while they’re not necessarily the only kind of underwear you need, they’re certainly the best jack-of-all-trades underwear on the market. Okay! Lesson’s over for today. Now we can take what we’ve learned about underwear (especially underwear for big men) into account while we take a look at some of the leading offerings for big & tall underwear on the market today. These are all boxer briefs, as we stand by our opinion that boxer briefs are most versatile option for larger men. We don’t exclusively recommend boxer briefs, but in the interest of versatility, efficiency, and low cost, we think that if there’s only one type of underwear you should own, it should be a pair of boxer briefs. So that’s what we’re looking at here. We’ve broken our list down into two categories: Comfort and Active, so that you can choose the kind of underwear that’s right for your lifestyle. Comfort underwears are typically either 100% cotton or a cotton/synthetic blend, and are better for lounging around. They’re also typically less expensive, due to the inexpensive blends of materials like cotton that are used to make them. Active underwear typically feature either purely synthetic materials or a much higher synthetic-to-cotton material ratio. This makes them more expensive than comparable comfort offerings, but also means they’ll hold up better to high-stress, active wear. These Hanes Tagless FreshIQ boxer briefs are a perfect example of a comfortable, durable, 100% cotton (except in 5XL, which is 60/40 cotton/polyester) underwear. They are built for all day comfort, with double-stitched seams, breathable material, and plenty of stretch to allow a perfect fit. The long legs help avoid chafing issues, and the waistband is very stretchable, allowing a perfect fit no matter how high (or low) on your belly you prefer to wear your underwear. They’re inexpensive, durable, and comfortable, and for those reasons, they earn high marks from us, and a place on our list. These boxer briefs have been specifically designed with the needs of larger men in mind. 100% ring-spun cotton is paired with a strong elastic waistband and no-ride-up legs which feature strong stretchability while avoiding the nasty ride-up that can sometimes happen with 100% cotton boxer briefs. They also feature an extra-long leg – up to 8”, which is very helpful when you’re trying to avoid chafing and other uncomfortable skin-to-skin contact. Sizes range from 2xl to 5xl, so even much larger men won’t have a problem finding underwear that will fit them perfectly. These Fruit of the Loom underwear combine a breathable cotton-mesh jersey with a fabric design that incorporates a blend of 91% cotton, 5% polyester, and 4% spandex to create a wonderful pair of underwear that stretch, breathe, and move with you, making them a great choice of anyone who wants the feeling of cotton without some of the more negative properties that it can have when worn by a larger man. The waistband is 1.5 inches, and made of a very durable, stretchy, yet comfortable elastic that sits flush against the waist without cutting in, and the moisture-wicking properties of the technical fabric blend paired with the stretchy, non-ride-up legs make these undies incredibly comfortable to wear even when you’re being active. These underwear are a great combination of durable, advanced fabric design and classic comfort, and we highly recommend them to anyone who may be skeptical about boxer briefs that incorporate larger percentages of artificial fabrics. These KAYIZU Soft Cotton Boxer Briefs are available in up to a 2XL size, and their stretchy 95% cotton and 5% spandex construction provides a great fit with tons of freedom, yet support that pairs beautifully with a moisture-wicking design that helps keep you feeling fresh and dry. The stretchy, yet shape-keeping fabric design pairs with specifically designed leg holes that feature stronger elastic to keep them from riding up, and help you avoid chafing problems. The waistband is strong and durable, with a lay-flat design that makes it almost unnoticeable. They’re also tagless, and feature stitching that’s very durable and comfortable – no loose threads or uncomfortable scratching. These are a great option if you’re looking for high value per dollar, as these are about half the cost per pair as some of our other choices, while still maintaining a high quality design that’s sure to please. 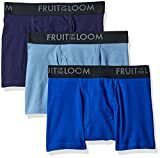 Unlike some underwear out there, this offering by Fruit of the Loom is designed specifically for larger men, with a fuller cut that features plenty of room while maintaining support, a high-quality ring-spun cotton fabric that’s selected for absorbency, durability, and comfort, and a plush-backed elastic waistband that’s designed to be comfortable no matter how low or high you prefer to wear your underwear. They’re also available in a range of sizes from Small all the way up to 6XL, so from the smallest man to those among us who are giants, you’re sure to find a pair that will fit you perfectly. The Kirkland Signature Men’s 4 Pack Boxer Briefs rounds out our selections for our comfort picks. Featuring a 95/5 blend of cotton and spandex, their microfiber design is specifically crafted for stretch, comfort, and absorbency, while providing plenty of moisture-wicking action, a durable design that moves with you, and a comfort-crafted waistband, as well as flat-seamed panels that help prevent chafing. All of these qualities, in addition to their low price per pair, make these an excellent choice, whether you’re in the market for a new brand of boxer briefs, or if you’ve never even tried a pair of boxer briefs. These are sure to please. There’s a reason ExOfficio is an industry leader in high-tech, quality active underwear, and the ExOfficio Give-N-Go makes their case perfectly. It’s expertly crafted from a 94% nylon, 6% lycra blend that gives spectacular stretchability yet maintains its shape, making it move perfectly with you even in the most stressful situations. The waffle-weave pattern helps create a large surface area which helps evaporate moisture and increases the breathability of this pair of underwear. In addition, it wicks moisture at an incredible rate, keeping you dry even in adverse conditions. It’s quick to dry and easy to wash, and its Aegis Microbe Shield keeps smelly and harmful microbes from being able to take root. These contribute to the incredible durability and wearability of these boxer briefs, and ensure that with proper care, they’ll last you years. It features long leg holes which will never ride up, and securely hold onto your legs, preventing any sort of chafing or uncomfortable skin-to-skin contact. Other features include a strong, absorbent elastic waistband, lay-flat seams, and a fully functional button fly. They’re not cheap, but if you need a pair of underwear that you can wear in any situation, from hiking or walking around the city to simply lounging around the house, or if you often go on long trips and like to pack light, you’re going to have a hard time finding a better pair to wear than these ExOfficio Give-N-Gos. These boxer briefs by Under Armour combine several proprietary technologies with a huge range of sizes (S-5XL) to create a pair of active underwear that are comfortable, easy to wear, and durable. Made out of a 90% polyester/10% elastane fabric blend, this pair of underwear features 4-way stretch technology that helps your underwear move with you, an enhanced Under Armour Moisture Transport System that helps wick away sweat and moisture, and a smoothly-crafted fabric with lay-flat seams and an articulated mesh fly panel that keeps everything exactly where it should be, even during high-intensity situations. They provide plenty of stretch, and the smooth fabric and shape-holding material means that you won’t suffer any kind of chafing or excessive rubbing problems. They are a little bit shorter in the leg-hole department than some of our other offerings, but the stretchiness and close-to-the-skin fit and comfort help this pair of underwear perform just as well as some of our longer choices. This pair of underwear by Adidas combines a stretchy, thin, yet durable fabric with a comfortable all-day-wear design that is as suitable for working out and sports as it is relaxing at home. The smooth, thin fabric makes these underwear a great choice if you’re looking for that “almost nothing there” feeling. Just the right amount of support combines with a smart design that almost feels like a second skin that’s so comfortable that you may forget you’re wearing any underwear at all. Other design features include a strong elastic, extra-thick waistband that provides a comfortable hold wherever you choose to wear these underwear, and a vented mesh design that helps release moisture absorbed from the body quickly and effectively, making this pair of underwear a great choice for hotter climates or more active users. This pack of Hanes boxer briefs is crafted with FreshIQ and X-Temp technology, which combine with the 95% cotton and 5% spandex materials to create a fit that’s comfortable enough for all day wear, and provides maximum odor and moisture absorption and dispersal. This pair of underwear is a perfect blend of comfort and active technology that’s as perfect for just about any situation. You get the cotton feeling of breathability with the spandex stretch, and the FreshIQ and X-Temp technology combine to create a dry, smell-free wearing experience, which is as appropriate for the office as it is to the gym. And at a great value 3-pack, if you were only going to choose one pair of underwear off of our list to try out, you’d be hard-pressed to find a better deal. BiggiesBoxers is just an awesome brand if you’re a big guy! Plenty of breathing room, extra space and most important of all comfortable on a whole new level. Biggies are one of a kind and the only manufacturer of 25XL underwear. They have a huge selection of materials to choose from, Silk jersey, Organic Cotton, Regular Cotton, Silk Jersey and loads of other great opportunities for you. Made in Silicon Valley following strict quality assurance guidelines! Our favorite brand for big guys underwear is biggiesboxers! While this list is by no means totally comprehensive, we believe that you’ll be able to find the right kind of boxer-briefs for you by taking a look at the list we’ve put together, whether you prefer natural or synthetic fabrics, or active designs over more comfort-oriented offerings. And there are more options out there for big dudes, but in our experience, briefs and boxers tend to be inappropriate for larger men. And whether you’ve never tried boxer briefs before, or your old pairs are just wearing out and you’re looking for a new brand, this list is sure to have a selection (or two) that will appeal to you, no matter what your preference is. So take a look, read a review, and find the next best pair of underwear for you. Until next time, happy shopping and happy learning.